I have digitized some compilations of earthquake slip regions from a few papers and summarize these on the map below. The two main references are Bilham (blue; 2004) and Bettinelli et al. (orange; 2006). There are a couple of earthquakes that are differently plotted in these two publications (e.g. 1934 and 1950). This earthquake of 2015 appears to coincide with the region that slipped in 1833 and the western portion of the region that slipped in 1934. Here is my original page for this earthquake. Here is an post that I updated later in the day. Here is a map from Bilham and Hough that shows the entire history for this convergent margin. This is more of a schematic view of these earthquake locations. There have been trenches that led to the interpretation of the 1100 A.D. prehistoric earthquake. Here is the map from Lave et al. (2005) which shows the estimated MMI contours (ground shaking contours). This map shows the area of the fault that seems to have slipped, with a fault length of approximately 150 km. Here is the Global Earthquake Model map and space-time diagram (Berryman et al., 2014). This is a cross section from the GEM report (Berryman et al., 2014). This shows Elevation, coupling coefficient, seismicity rate, temperature on the main Himalayan Thrust (MHT) HFT from Ader et al. (2012). 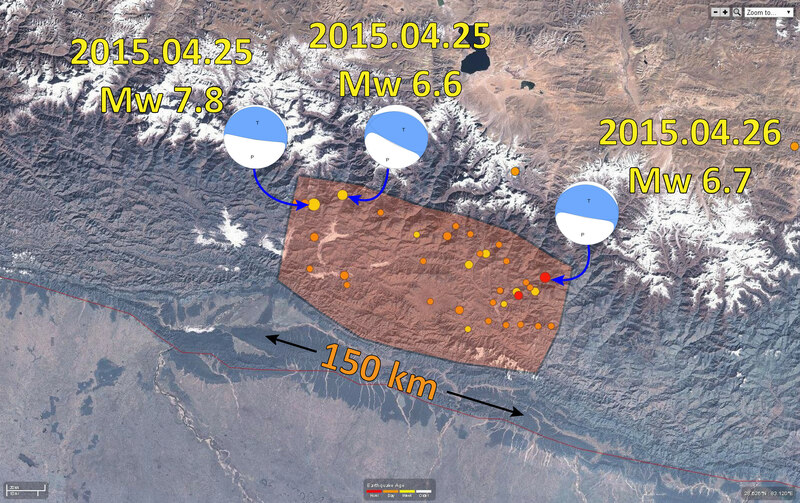 This shows today’s seismicity at a more local scale. The top map uses aerial imagery and the bottom map is overlain upon SRTM (Space Shuttle Topography Mission) data. This is from a security camera and gives us an idea about the local duration of ground motions. Historic Slip patches are as in the above maps. Ader, T., J.-­‐P. Avouac, J. Liu-­‐Zeng, H. Lyon-­‐Caen, L. Bollinger, J. Galetzka, J. Genrich, M. Thomas, K. Chanard, S. N. Sapkota, S. Rajaure, P. Shrestha, L. Ding, and M. Flouzat, 2012. 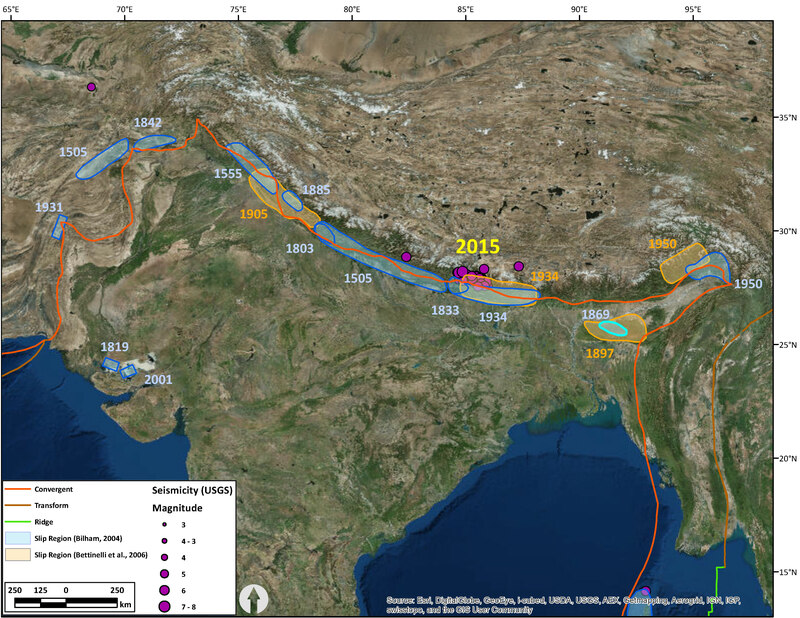 Convergence rate across the Nepal Himalaya and interseismic coupling on the Main Himalayan Thrust: Implications for seismic hazard, J. Geophys. Res., 117, B04403, doi:10.1029/2011JB009071. 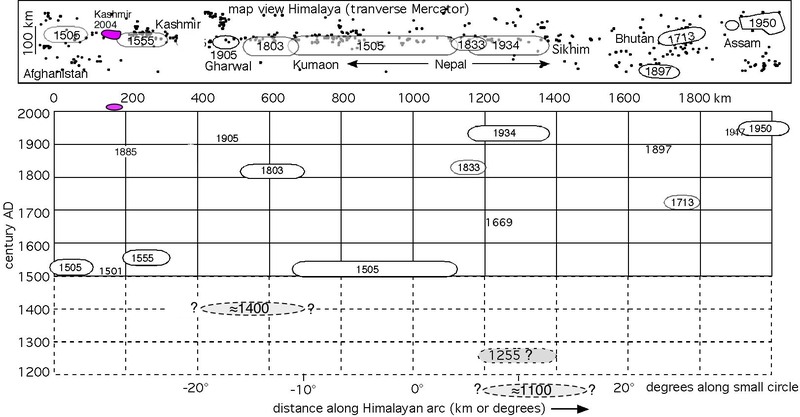 Lavé, J., Yule, D., Sapkota, S., Basant, K., Madden, C., Attal, M., and Pandey, R., Evidence for a Great Medieval Earthquake (È1100 A.D.) in the Central Himalayas, Nepal, Science, vol. 307, p. 1,302-1,305.